Not really what you want to see when you get out of the car. The air was gushing out of that tire so fast, I could hear it as soon as I opened my door. We all had a good laugh at my expense, I mean, you have to be pretty talented to get an entire bolt lodged into the thickest part of the tread. The Canadian took the tire off that evening, took it to work the next day to get it fixed, and by the next evening I was ready to hit the road again. Sure it cost us a little bit, but it was quick and painless, all taken care of, and we’re still laughing about it a week later. 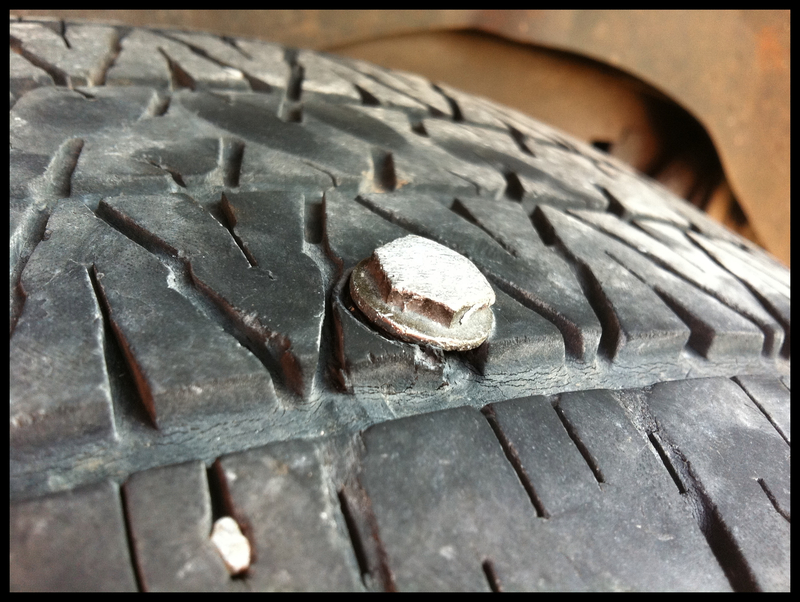 Now, what if I had told you that when I saw the bolt in my tire, I just ignored it? Maybe I thought if I pretended it wasn’t there it would go away. Or maybe I thought over time it would fix itself. What if I continued to try to drive on it? Even better, what if we had removed the whole tire and just left the car that way? Ignoring it would have let it go completely flat, it wouldn’t have repaired itself. If I had continued driving as though it wasn’t there I would have damaged the tire beyond repair, and if I just took the wheel off, the car couldn’t take me anywhere at all. But the truth is, we sabotage our own lives the very same way. Some of us have been doing it every day for months, or even years. Say what? Stay with me. Maybe you said something you shouldn’t have to a friend, or done something that, even unintentionally, hurt someone’s feelings. Perhaps you need to apologize to someone, or confess about what you’ve done. On the flip side, maybe someone has hurt you and you’re just bottling it up and letting it eat at you. All of those scenarios are just like that bolt in my tire. Left unattended to, they can literally drain the joy from your life. Ignoring it just makes it worse and causes more damage, sometimes irreparably so. Allowing it to go completely unchecked can be paralyzing and all-consuming. A friendship, a relationship, your own peace of mind are all too precious to allow them to be destroyed by something you can take care of. Sure, it may not be easy, it might be uncomfortable, and it may cost you emotionally, but in the end, it’s worth it. Just knowing you’ve done all you can to make amends is enough to start the process of letting the guilt go. Here’s my challenge for you. Pick up the phone and call whoever it is you need to make amends with. Let them know they’ve hurt you, or apologize for hurting them. Not later today, not tomorrow or next week. Right now. Whatever you do, don’t waste another day driving around on a flat. Get it fixed, and get back on the road. You’ll be glad you did.